Galway East Tourism - City Limits in East Galway, West of Ireland.Galway East Tourism - City Limits in East Galway, West of Ireland. City Limits is an emporium of entertainment for all ages, guaranteed to entertain the family! City Limits provides the very latest in bowling and adventure! The illuminating glow track in City Bowl, the impressive pool and games area, action-packed Laser Quest, Inflatable City, Air Park Climbing Wall, and themed Amazonia Adventure Restaurant are all on site. 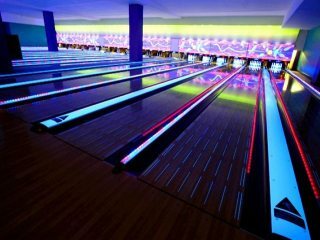 Impressive Glow in Dark Bowling Lanes. It has 18 lanes, six of which are fully licenced with computerised scoring and automated bumpers for beginners. Bring a bunch of friends and give it a try. City Bowl can take your game to an unexplored new level with Extreme Bowling - a feast of lights, music, wild bowling challenges and of course your favourite food and beverages. For Toddlers, and includes soft cushioned rockers in the shape of jungle animals, soft building blocks, a baby ball pool, treasure hunt, shape games and bendy mirrors. For older or more adventurous kids, there is a large ball pool with crawl tube, slides, a dizzy disk and an extended car track. There's also a large inflatable obstacle course and an area for arts and crafts, suitable for kids of all ages to enjoy. Be challenged both mentally and physically in Zero Limits! Steel yourself as you tackle our 5m Climbing Wall and while suspended from the roof of Zero Limits on our Air Park be sure to be alert as you maneuver your way around the Laser Quest arena. Or why not try out our brand new Inflatable City guaranteed to be enjoyed by all ages. Part adventure, part restaurant the Amazonia Restaurant resembles a tropical rainforest with waterfalls, lush vegetation, and lots of jungle treats for the children.